Everyone likes to watch horror movies during October. but nowadays they are making TV shows that are better than some movies. If you only have an hour a night to spare or feel like you need to binge-watch something really great, then you are in the right place! As I've mentioned before on my blog, I am a TV show connoisseur. Meaning, I have seen a lot of TVs and know what's worth watching. American Horror Stories: I've mentioned this one on my post about TV shows to watch. If you haven't seen it. Start from season 1. Season 1 is the best, but they have so many great seasons. Season 8 is on now and they are doing fantastic so far. Bates Motel: I highly suggest you see this show if you're a fan of Psycho. I want to rewatch all the seasons, and then watch psycho. The last episode of the series is the beginning of the movie. Stranger Things: I feel like I don't even need the mention this one. Everyone has seen it and loves it. Scream Queens: This is a slasher show with lots of comedy. The first season is the best season so if you watch it, start from the beginning. Penny Dreadful: This show ended fast too early for my taste, but I think the main actress did an amazing job. Check it out! The Walking Dead: I know this isn't exactly a scary show. And this coming season will probably be my last season to watch. but I still love this show. Start Season 1 episode 1, it is so addicting! The Twilight Zone: I have loved this show since I was little! It might be a little cheesy compared to stuff more, but it's a true classic that everyone should watch! Ash vs. Evil Dead: This is a comedy horror. Man oh man, if you love blood and guts check this one out! It's great! The Exorcist (TV show): I personally hate exorcism movies but I still watch them for some reason. Try it out if you love that sort of thing! Twin Peaks the return: I, unfortunately, didn't watch the original Twin Peaks from back in the day, but oh my goodness the return is so good! It's so confusing the entire time. Has some creepy stuff, and I literally did not understand the season finale. I was convinced they were going to do one more episode to clear up the confusion.. but no.. you have to try this one out! 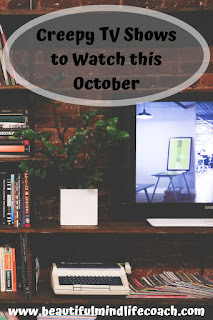 Tell me if I'm missing any good creepy shows that would be fun to watch in October! Have you watched any of these shows yet? Which ones are your favorite? I love getting comments! Until next time my beautiful minds! This month is going to kill me. I am terrified of horror movies and I am never able to finish any that I try to watch. Hopefully one day. I was thinking about ways to celebrate Halloween here in India, and you gave me the perfect idea. Thanks for sharing. I'm not into Halloween but your selection is awesome! I have seen a lot of these, but some I have not. I can't always do scary movies because I hate to jump. My daughter loves them though! I am not really a fan of scary movies, I rarely watch them to be honest. The only one I watched from your list was American Horror Story and that is creepy as hell. I used to love the creep shows but now I have a hard time with them. I am a very jumpy person and scare easy. I do not like creepy or scary shows!!! But thanks for sharing. Now this is such a great round up for creepy things for this month! I keep meaning to try out Penny Dreadful, so I think I need to try it for this month. I dont find horror as entertaining, but watching this type of movies only invites bad spirits to join you while watching is not a good idea. This is a great round up of scary movies! October is the perfect month to catch up on horror movies and shows!! Great list! I want to watch stranger things, my teen already watched the whole season and he really enjoyed it. Don't forget Supernatural! The whole series is on Netflix and Season 14 starts later this month! My favorite! I'm not a big fan of horror movies. I watched The Ring back then and one other Asian horror movie and ended up closing my eyes for almost the whole time. Thanks for sharing anyway! I love Scream Queens and Stranger Things! They are such great shows! Twin peaks is very good too! I have not watched any of the other shows! I am not a fan of horror movies, my hubby watches it. I check these trailers thanks for sharing otherwise I don't even know this was existed. Omg, this is a big fat NO from me!!! I get way too scared, but I will show this to my husband, because he LOVES them!! Also, would True Blood qualify for this list? Like I said, I don't know much about scary movies and shows, but I know that my husband watched it and loved it. I am a coward in watching horor movies, ha ha .... It affects me when I am alone in the night. But I love watching Twin Peaks. The theme song is beautiful and the story is great. This is fantastic. A complete DATE collection to freak out the girl hahaha love this! I loved Penny Dreadful, Stranger Things and every season of American Horror Story. They are a little scary but well written. You have some pretty good options here! I have heard that American Horror Story and Stranger Things are really great shows. Not quite what I'm into, but I know many people that love it! So many of my favorite shows are listed here. I need to get on AHS this season!